“The Lord is my portion,” says my soul, “therefore I will hope in Him” (Lamentations 3:24, ESV). Fix my job problem, God. Instead of leaning in to hear the whispered will of the Lord, I selfishly shout my will, my desires and my demands. Lord, give me relief from life-pressures instead of giving me strength to endure them. When I’m desperate to fill my mega-sized heart-cart with things that I want, I rob myself of what really matters: the pursuit of God and the blessings found in Him alone. The truth is that even those of us who are Jesus-girls, you know… good Christian women who strive each day to live for Christ… continually sin and wallow in the shallow, unsatisfying waters of discontentment. We tell God what we’d like Him to do for us so we can be happy and then expect Him to intervene in ways that suit us. We blur the lines between our wants and our needs – between our plans and God’s plans. In part one of this devotion, we were reminded to rest in God. We looked at His care of the sparrows, considered that God loves us even more than he does the birds of the air, and were challenged not to worry. Today, we focus on prioritizing God above all else. David modeled this beautifully when he called out to God in the midst of trouble and recognized Him as being enough. I cry to you, O Lord; I say, “You are my refuge, my portion in the land of the living” (Psalm 142:5). In Psalm 119, the psalmist recognizes God as his portion and takes the moment of surrender a step further by tethering his satisfaction with obedience. You are my portion, O Lord; I have promised to obey your words. I have soughtyour face with all my heart; be gracious to meaccording to your promise (Psalm 119:57-58). There will always be days that we want to yell, C’mon, God! Throw me a bone here! I could use a little help, please! It is not a bad thing to call to God in the midst of our struggles. In fact, we should! We must! The big game changer, however, is not God’s presents – but His presence. Refuge from our circumstances and contentment in the midst of them is found in the center of our surrender. So what’s the connection point between our longings and His provision? Once again, Spurgeon hits the nail on the head. We are distracted cravers when we expect our people, places and things to fill our hearts as only God can. God loves us so much. Why do we forget this all the time? His plan is perfect and we can trust Him. He knows our needs and desires. Set your list of wants aside today and seek God. Go before Him with a heart of worship and adoration. Get lost in His presence. Choose Him as your Portion. Dear Lord, Please be my Portion. Forgive me for the times when I seek Your blessings before I seek Your heart. You are all I need. Spend a moment in prayer asking the LORD to increase your thirst for Him. I co-wrote a song called “Center of Surrender” that invites God to be our Portion in a very personal way. Click here to listen to the song on my blog…let the lyric to become the prayer of your heart today. 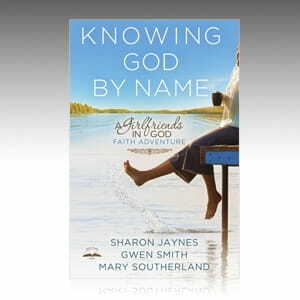 Today’s GiG devotion is adapted from Knowing God by Name by Sharon Jaynes, Gwen Smith, & Mary Southerland by permission of Multnomah, division of Random House, Inc. Get a copy from your favorite Christian retailer or CLICK HERE to order the book from Amazon.